My absolute favorite comic strip as a kid was Alley Oop, the beautifully drawn adventures of a caveman with a very sweet ride: a savvy stegosaurus named Dinny. This fantasy of humans getting to share real time with living dinosaurs has fueled mass media entertainment from The Flintstones cartoons to Michael Crichton’s tale of resurrected saurians, Jurassic Park. But in the end, say scientists, their lovely bones and fossils show that all the dinosaurs perished in a mass die-off many millions of years ago. Or did they? What if, in the deepest, least accessible parts of the African continent, a small relict population of something like an Apatosaurus lives on? The Congo’s legend of the creature called Mokele-Mbembe insists that is exactly the case. And author Bill Gibbons is one of a small group of investigators to have made that trip in person – several times. Other adventurers had traveled to western mid-Africa from as early as 1776 in search of huge, long-necked semi-aquatic beasts reported by local people and missionaries. Gibbons covers all these previous expeditions in proper detail before delving into his own considerable efforts that began with his first trip in 1985. Gibbons lays out a meticulous account of his expeditions, including not only a thorough record of creature lore and sightings reports but his own trials with sickness, risky travel situations, and local people that were often not cooperative. He also experienced a striking religious conversion during his first trip and shares his epiphany as an integral part of his story. 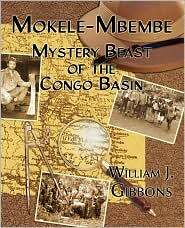 Although Gibbons was never able to get that definitive proof, he does a good job of compiling all known data and evidence of Mokele-Mbembe and of several other mysterious beasts. I do wish that the book included a standard index! But Gibbons hopes to return for another shot at filming this creature. As a fellow seeker of elusive and anomalous animals, I wish him the best of luck, and I think that Alley Oop would say the same. Thanks Bill and go get that Mokele-mbembe!!! I tried to leave a comment earlier, but shut the page by accident. Thank you for you kind review of my book. I am off to Cameroon in November for a two week foray into an unexplored part of the upper Dja River with French investigator, Michel Ballot. All i want is to get Mokele-mbembe on film – and a shot at the Art Bell show with the one and only George Noory! I might make a trip to Wisconsin next year in search of the elusive Dog Man! Your book, The Michigan Dogman was absolutely riveting and well worth the read! I read the whole thing during my Alaska cruise last month. I hope it sells well for you!